UPDATE 10/25/2012: If you are not comfortable contributing electronically, you may send a check payable to "Omar Perez" at "PO BOX 7913 Newport Beach, Ca. 92658"
A couple of weeks ago, a motherless individual crashed into my only means of reliable transportation while it was parked in front of my house. This individual fled the scene almost crashing into a produce truck parked a few cars behind mine. Now, after numerous calls between my insurance provider and I, there's no evidence that their investigation has given any results on finding this individual, and thus... they won't cover repairs. The police department is behind on their investigation as well. I am struggling commuting to and from work (about 20mi), getting rides from family or friends that have the time, but are not always available. Taking the bus, not reliable enough since the timing isn't always the same and there have been times I clocked-in late. My goal is to collect, with your appreciated help, about $500.00 to replace the front axle to fix the door, fix the tire, bumper and hood, pay for towing, labor... and refund for gas to those who give me rides until the car is drive-able again. The amount is an approximate, and even if it the final bill ends up being higher, at least with your help I will make a huge dent covering the car repair costs. Here is a picture of the car. I still get frustrated just by looking at it, but I keep reminding myself that it could have had been worst. Luckily no one was in the car, and the children that get dropped-off by this corner had just completely cleared out almost a minute prior the hit-and-run. It was the afternoon of Friday the 28th day of September, my cousins were over to chill at the pool and I had just arrived from work (fifth and last day of my second week, 13:30). We were hungry so I started cooking while they were getting ready for the pool. I was half way done slicing the tomatoes when I hear the screeches, twice before that horrifying sound, CRASH! We all stopped what we were doing, ran to the door and just get a glimpse of the dark truck/SUV type vehicle trying to flee. Unable to control the vehicle, the driver almost hits a parked produce truck and near-misses another car just before flooring it again to disappear from the gathering crowd. Just as we were dealing with the initial shock, we look around to see which one got hit. All seem to be alrig... "THERE!" my cousin says, and to add to my frustration... it was MY car that was at the receiving end of the impact. The crowd grew, and everyone recounted the event as they experienced it. We gathered all the information as accurate as possible from the bystanders (including a partial plate number), called the police department and the insurance provider. Made the reports, and that was the it. Investigation: Pending. Seeing as how the insurance provider was taking too long to send an agent to evaluate the car as per their policy, I kept making calls that lead no where. Decided to remove the car from the street since I didn't want to get a parking ticket on street sweep day (car was there for almost a week since the event). 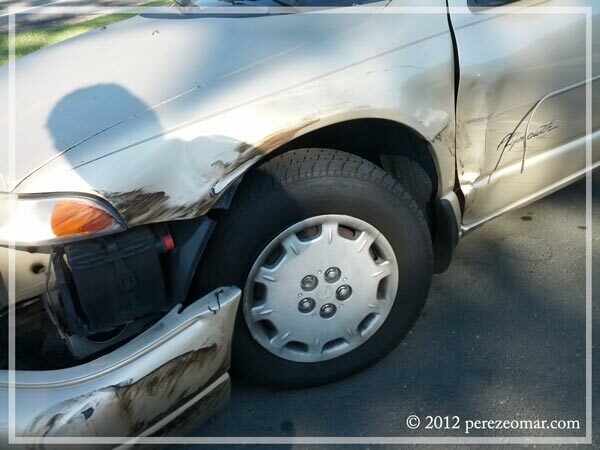 Weeks passed and just last Thursday, the insurance agent checked the car. Tells us that they won't cover repairs since we don't have any complete information on the driver that hit it. Now I'm left with a car that can't go anywhere. Just finished week five of work (approximately 46 hours at minimum wage). And will have to fix the car without refunding from the insurance provider. I really need your help, any amount will suffice... it all adds up, and will be of great relief even if the goal isn't met. THANK YOU!